Photo by Chris Reich, NSU Photographic Services | The Wellness, Recreation and Activity Center at Northwestern State University was dedicated in honor of the late Dr. Randall J. Webb in a ceremony held Tuesday on what would have been Webb’s 75th birthday. 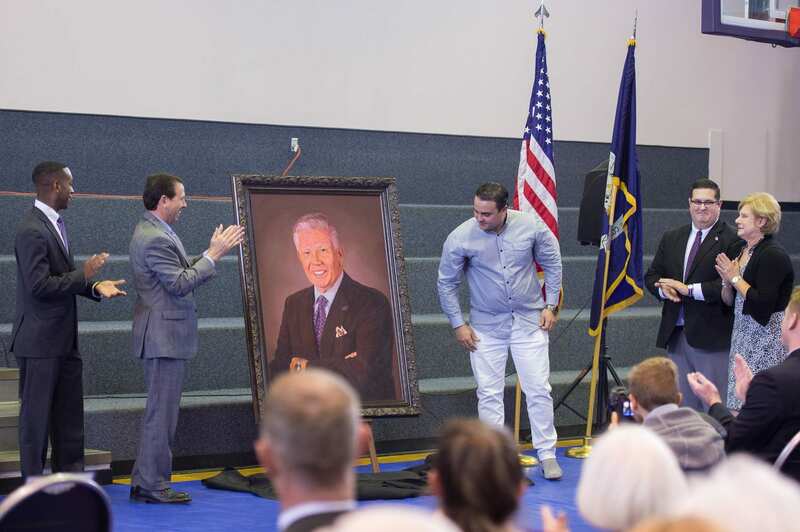 A portrait of Webb, the longest-serving president in NSU history, will hang in the facility. Participating in the unveiling of the portrait are, from left, SGA President Tre Nelson, Northwestern State President Dr. Chris Maggio, artist and graduate student Osvaldo Ferrer Miranda, Shayne Creppel, director of Greek Life and assistant director of student life, and Webb’s widow Brenda Webb. NATCHITOCHES – Northwestern State University dedicated its Wellness, Recreation and Activity Center in honor of the late Dr. Randall J. Webb in a ceremony held Tuesday before a large crowd on what would have been Webb’s 75th birthday. Webb was the longest-serving president in the history of Northwestern State, holding the position from July 1, 1996 to Dec. 31, 2014. Northwestern State students approved a referendum in 1998 to fund construction of the Wellness, Recreation and Activity Center. The $6.9 million project converted the former Intramural Building into a 81,000 square foot facility which was completed in 2004. SGA President Tre Nelson experienced an example of Webb’s feeling towards students the first time the two met at a party a few months before Nelson enrolled at NSU. He said Webb never waivered in his support for the athletic program, and had strong views about what the program should be.